Why are investors afraid of losing money in the Ukrainian gas transportation triangle? Winter is coming and it might aggravate again seasonal energy concerns in Europe. In recent years, such an event as tripartite talks between the EU, Russia, and Ukraine on the security of gas transit through Ukraine's gas transport system became a harbinger of the approaching winter season. In 2014 after seven rounds of difficult negotiations, moderated by Günther Oettinger, the former Vice-President of the European Commission, yielded finally a trilateral protocol, agreed by Russia and Ukraine that secured gas for Ukraine and ultimately also for Europe. This year, on September 25 after several rounds of negotiations spanning a number of months, once again Brussels, Moscow and Kiev signed the protocol on the terms for gas supplies from Russia to Ukraine in the period from 1 October to 31 March 2016, which should safeguard the security of gas supply to Europe in the coming winter. As the Vice-President of the European Commission responsible for Energy, Maroš Šefčovič commented: "The agreement on the terms of the new Winter Package is a crucial step towards ensuring that Ukraine has sufficient gas supplies in the coming winter and that there is no threat to the continued reliable gas transit from Russia to the EU". Yet everyone would now seem to agree that conducting multiple round negotiations ending after midnight is becoming a new pre-winter tradition in Brussels, as the trilateral agreement achieved with such complications is temporary, and it will be repeatedly needed to go through these hard times. Moreover, it may happen even earlier. On November 25, only two months after the two countries reached an EU-sponsored agreement Russia stopped gas shipments to Ukraine because Kiev had not paid in advance for future supplies. In the meantime, the European Commission is trying to behave as if nothing can happen and it seems resigned to the fact that the problem of Ukrainian transit will continue to hang over Europe in the future. It is also reflected in the report submitted by the European Commission on the Energy Union development in particular stating that "it is in the interest of all parties that Ukraine remains an important transit country". Thus, Europe should expect new episodes of this long-running diplomatic serial devoted to trilateral gas talks and "seasonal packages." However, the allegation that there are "the interests of all sides" - is an obvious exaggeration. Furthermore, taking into account the real situation in the Ukrainian economy as a whole and in its gas transport sector, in particular, the expression "remains an important transit country" looks like an attempt of no more than wishful thinking. In fact, there is nothing new in that Brussels would like Ukraine to keep up a role of "an important transit country". The question that arises then, is what the European Commission has actually made in that respect, more importantly, what has been done by Ukraine itself in order to remain in a position of major transiter of gas, which the country obtained in Soviet times? With regard to the EC actions, they are clearly aimed at hindering Russia's plans to diversify routes of gas deliveries to Europe, which envisaged the construction of new gas pipelines, and at compelling its largest gas supplier to use further the Ukrainian transit route. "If you look at the construction and plans of gas pipelines, one of the goals is to make the Ukrainian transit system less relevant, or to cut off supplies through Ukraine completely. This would have very negative consequences for energy security in Europe, because the Ukrainian transit is very important, it is the largest, at 140 billion cubic meters per year," said Vice President for Energy Union Maroš Šefčovič speaking to journalists. Thus, as it is argued in Brussels the rejection of the gas transit through Ukraine would result in a threat to Europe. However, all one has to do today is just to take a look at the overall condition of the Ukrainian transit and to be sure that such political statements motivated by a desire to present the plans of Russia as a threat, but in fact it turns out the other way around - this particular gas transit through Ukraine is becoming a major threat for European energy security. And those who suggest otherwise would much rather to come down from heights of the Brussels political Olympus to the ground and, more specifically, directly to the Ukrainian gas transportation system (GTS). Try to find an excuse why a very alarming issue concerning current technical condition of the Ukrainian GTS is deliberately left behind the scenes of forward-looking policy of the European Commission, not to mention the need to modernize its management systems. Let's see if this is indeed the case as the legend about an Austrian soldier Sigismund of Altensteig says: "That's where the Shoe pinches!" In September 2014 the Institute for Economic Research and Policy Consulting from Berlin published the results of its study "Improving gas transmission network regulation in Ukraine by implementing Energy Community rules - a tailor made proposal", the main conclusions of which begin with the following phrase: "Gas transit through Ukraine … are decreasing. The pipeline system is ageing and the current regulatory framework does not meet the European standards". 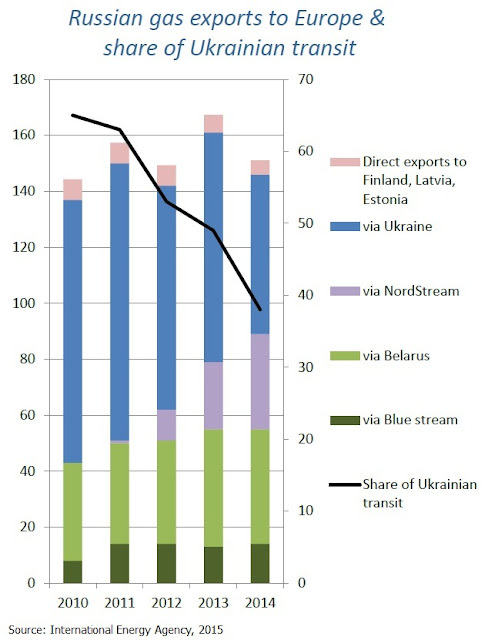 It is an objective reality that is reflected in long-term decline in the share of Russian gas transit to Europe through Ukraine, represented in the figure below. In the last five years from 2010 to 2014, the share of Ukrainian transit in Russia's gas deliveries to Europe has fallen by one third from above 60% to a level under 40%. The physical volumes of gas delivered through Ukraine to Europe have also declined together with the share of Ukrainian transit. In 2014, Ukraine transported to Europe by one third less Russian gas than in 2013 - only 59.4 bcm. In 2013, Russia's gas deliveries through Ukraine to Europe amounted to 83.9 bcm. Before that there was a significant decrease in volume of gas in 2012 - 81.2 bcm, as compared to 104.2 bcm in 2011. It cannot be overlooked, however, that in the recent decades an annual volume of Ukrainian gas transit has never been even close to the level of 140 bcm, although Vice-President Maroš Šefčovič suggests that Europeans can count on this transit potential. The projected capacity of the Ukrainian GTS at the exit to Europe actually amounted to 142,5 bcm. But in practice according to Ukraine's company Naftogaz, the fluctuations of volumes of gas transit to Europe in 1991-2014 ranged of 92.9 (1992) up to maximum level of 121.5 (2005) bcm. Ukrtransgaz (subsidiary of Naftohaz) has predicted that gas transit through Ukraine to Europe in 2015 will account for 65-66 bcm. Nevertheless, everybody has to be borne in mind that the consumption of Russian gas in Europe imported via Ukrainian transit will be actually less because of the reverse operations. After crossing the border of the EU, part of the gas is returned back to Ukraine. There are several points facilitating a reverse flow near the border of the EU and Ukraine. For example, in September 2014, Slovakia upgraded a pipeline to supply reverse flows to Ukraine. The link runs from the Vojany compressor station in Slovakia across the border to the western Ukrainian town of Uzhgorod and has a capacity of 14.5 bcm per year. It would be unnecessarily to say that gas consumers in Europe unlikely noticed a weakening of transit flows through Ukraine shown in the figure above, because gas supplies to Europe were redirected bypassing Ukraine's GTS on other routes particularly via Nord Stream pipeline under the Baltic Sea. The colors on the figure above indicate gas volumes imported by the EU over different transportation routes from Russia. They demonstrate how diversification of gas-supply routes to Europe has been changing during the recent years that, as we know, is of great importance for security of supply. The position of the Ukrainian GTS is worsened also because, according to various estimates, the sharp decline in the transit volume led to Kiev has already lost about a billion USD of transit revenues. Besides it has long been discussed that if the transit flows to Europe fall less than 60 bcm, the profitability of the Ukrainian GTS will be in question. The prospect of losing the transit market is more than real and very painful for the Ukraine's economy. The current contract between Gazprom and Naftogaz for gas transit to Europe will expire in December 2019. In that context, it is appropriate to recall that the contracts on gas supplies to Ukraine and gas transit to Europe for 2009-2019 were signed on January 19, 2009 after the severe gas crisis, which as many still remember, was accompanied by gas cuts in Europe. At the beginning of January 2009, a total of 18 countries experienced a drastic reduction in gas supplies through Ukraine. For example, from January 6 in Austria and Italy deliveries dropped by 90%, and from January 7 in Slovakia and Slovenia by 100%, etc. It would be difficult not to recognize that in this critical situation the existing diversification of gas supply routes from Russia bypassing Ukraine revealed its advantages, when despite gas supplies via Ukrainian transit was shut off in Germany by 100% and in Poland by 90%, imports to these countries continued since it was forwarded on other pipelines through Belarus. The same happened in Turkey where the increase in imports of gas through pipeline Blue Stream under the Black Sea compensated for a reduction of transit deliveries from Ukraine. The absence of a new contract for the supply of gas to Ukraine in 2009 and Ukraine's debt for gas delivered in 2008, which had reached 2.4 billion USD, was a trigger for that conflict. At the same time, Ukraine was accused of siphoning off gas from its GTS destined to be imported to Europe. As is known, this year Russia announced that it would not extend the transit contract with Ukraine on disadvantageous terms. Apparently, the European Commission now does not rule out that Russia will fulfill its intention not to renew the transit contract after 2019. There are extensive actions in the EU that can be considered as preparations of the European Commission for such a scenario. The European Commission promotes the TANAP pipeline, has given Project of Common Interest (PCI) status to three other infrastructure projects including Eastring pipeline from Slovakia to Bulgaria, Tesla pipeline from Greece to Austria, and the Bulgaria — Romania — Hungary — Austria bidirectional transmission corridor (currently known as "ROHUAT/BRUA"), not to mention the forthcoming LNG plans. All of these steps taken by the Commission may be considered for certain as the preparation of alternatives in case of closing of the gas transit via Ukraine. It is not surprising that the European Commission is trying to insure in such a way against uncertainty in the Ukraine crisis. To date, there are no indications that Ukraine itself is able and willing to make constructive efforts for saving the gas transit to Europe after 2019. In fact, the urgency of the problems led to the crisis in the Ukrainian transit has not been alleviated, but on the contrary, it has considerably worsened over the years since the severe winter test in 2009. Ukraine's debt have increased, but the state itself officially declares its persistent insolvency. At the moment two months after signing the winter package Russian company Gazprom has stopped gas supplies to Ukraine on 25 November since Kiev had yet to pay in advance for future supplies. Ukrainian economy is on the lowest level ever and is experiencing an unprecedented growth of corruption. According to more than optimistic analysis made by Fitch Ratings, in 2016, Ukraine's economy can increase of only 1 percent and in 2017 - up 2.3 percent; given that the factors caused the deep recession in 2014-2015 remain unchanged. Everything indicates that the attractiveness of Ukraine as a place of investment now is close to zero. Therefore, this country has no any option but to rely on sovereign debt restructuring, as well as the miraculous appearance of foreign investors. It is necessary to mention that the World Bank, the European Investment Bank, or other politically engaged moneylenders far removed from private business and social interests are hardly possible to include. Since last year, Ukraine has been trying to sell nearly 50 percent in its GTS to EU and U.S. but Western buyers are not willing to rush to take up the offer realizing that the system's value depends on a steady supply of Russian gas. They prefer to keep watching over political twitches and twirls within the gas transportation triangle EU-Russia-Ukraine from outside. It would be logical to assume, therefore, they do believe that if their business ships fall in that kind of the Triangle right now... as you also know their crews will be at unreasonably high risk of being lost. So it is no wonder that there are no signs of new private foreign investors in the Ukrainian gas transport system. Nobody would like to be at risk of disappearing in the Ukrainian gas transportation triangle. Why are our policymakers in Brussels, in spite of everything, still attempting to preserve a worn-out Ukrainian gas transportation system as some sort of political relic? And that is important, who will ultimately have to bear these expenses?